A team of British scientists believe they have found the first evidence of life arriving to Earth from Space. A widely held belief when discussing the origin of life on planet Earth is that it all began here. However, there are still many diverse theories under the umbrella of Abiogenesis that could plausibly explain how we all came to be. Many have their roots embedded on Earth, but some that claimed a more direct extra-terrestrial involvement than meteorites simply carrying ice to Earth, never seemed to gain much traction. 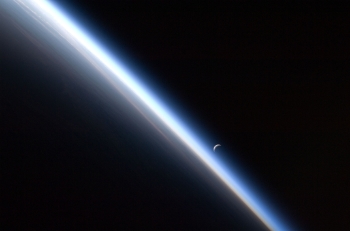 Now, with recent high altitude sampling of the upper atmosphere, a team of scientists claims to have found the first evidence of organisms to have originated from outer space. The experiment, performed by the University of Sheffield, launched a balloon high into the stratosphere from Chester to collect samples at heights ranging from 22km to 27km. The rig carried microscope studs that were only exposed to the atmosphere upon reaching the designated heights before being sealed away for their descent. They returned to solid ground safely near Wakefield and the samples were quickly analyzed. The team discovered they had captured a diatom fragment and some biological organisms, which were considered an unusual find due to their large size. They were reportedly too large to have been carried up into the atmosphere from the Earth's surface. The results were a huge surprise to the team, which saw them as a revolutionary breakthrough. "If life does continue to arrive from space then we have to completely change our view of biology and evolution," said Professor Milton Wainwright, who led the research team. "In the absence of a mechanism by which large particles like these can be transported to the stratosphere, we can only conclude that the biological entities originated from space." He goes on to postulate that with the evidence of life continuing to arrive on planet Earth, "life is not restricted to this planet and it almost certainly did not originate here." He notes that there are indeed events on the planet that can eject such particles into the stratosphere, most notably a volcanic eruption. However, none occurred during the three year sampling process. This is by no means the end of the team's work, Professor Wainwright is hoping to extend the program with another balloon flight next month. With new samples, he hopes to carry out isotope fractionation. "If the ratio of certain isotopes gives one number then our organisms are from Earth, if it gives another, then they are from space. The tension will obviously be almost impossible to live with." The next tests are due to take place after the Haley's Comet meteorite shower where it is hoped that more new or unusual organisms will be found. There are numerous ramifications of such data, should it be proved correct. These findings are the first physical evidence to point towards life beyond our atmosphere. If meteorites containing alien organisms are found to be traveling throughout the galaxy, it would be harder to deny the possibility of another Goldilocks planet becoming home to alien life.